This is another Strelets set where two apparently unrelated subjects share the same box. We understand this is because they worked together during the Peninsular war, but whatever the reason it means two more previously unavailable subjects are now covered. Regular readers will know that we do not care for mixed sets like this, though at least there are a good many poses on offer. The first two scans above show the Polish grenadiers, where many of the poses suggest hand-to-hand fighting rather than movement in large formations. The box art implies the sculptor had street fighting in mind when making this set rather than open battle, so these are consistent with that theme. One man is firing down, presumably from a building or fortification, and there is a nice study of a wounded man being helped to aid by two comrades. By far the majority of the figures are French dragoons, and here too the emphasis is on close-quarter combat. Several of the men are bayoneting or clubbing, and some are firing upwards, as if at the walls of a town or the upper part of some building. 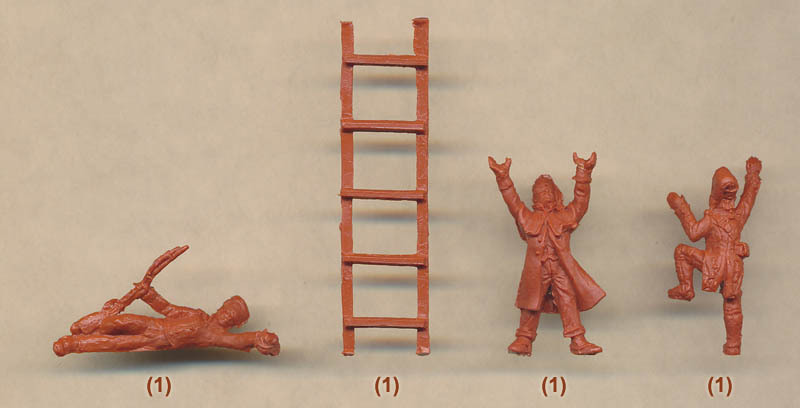 There are two sappers - most useful in a siege - and two ladders have also been included. One seems to be dragged by two men, and the other is being held up by one man as another climbs it. This last group has a small base for the man holding the ladder, but there are no pegs or other means of fixing the join, so a very fragile glued joint is all that can be achieved. The dragoons were perfect troops for the war in Spain, taking part in many anti-resistance operations as well as against the allies. However supply was sometimes a problem, and many troops adapted to the climate in different ways. The uniforms on these men demonstrate that with various coats and leg wear, and a good many have adopted the bonnet de police or Pokalem (only introduced in 1812) in preference to their normal helmet. Some of the Poles have a peak on their bearskins and others do not, but since sources show that both styles were to be seen this is fine. Given the sometimes ragged nature of these men, their appearance seems appropriate in this set. 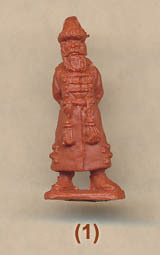 The standard of sculpting is variable with these figures, with both good detail and bad faults. There is plenty of nice detail such as the wicker holders for the water bottles on some men, but in other areas detail is lacking or very poor. The eagle on the standard, for example, is very difficult to make out, and some muskets and sidearms are much too thick and lacking any definition. Some of the dragoon helmets are not well done, and there are some awkward stances which seem unrealistic. One man (3rd row, 3rd figure) is firing his musket while steadying it right beside his shoulder, an uncomfortable and ineffective position, and the man wielding his firearm as a club (9th row, 1st figure) would not have got much force behind it as he holds it half way along the barrel. The detail may not always be present, but at least there is no flash and no mould lines. Some of the chosen poses are difficult to explain, such as those at row 8, figure 2 and row 10, figure 1, but in general the more unusual poses add to the worth of the set. The missing detail is a disappointment, and the little assembly for the scaling ladder is extremely difficult to both construct and keep together, even if you ignore the fact that the rather crude ladders are no more than three metres long anyway. Strelets are not good at items that fit together, and perhaps should avoid such things unless they can do them well. An interesting addition to the vast array of Napoleonic sets, but one that will require a lot of work to bring the best out of it.